The tax request would be nearly $400 a year for an average household for the Sound Transit 3 package. Voters in King, Snohomish and Pierce counties could see the proposal on the November ballot. This fall’s Sound Transit 3 ballot measure would deliver light rail to Ballard as late as 22 years from now, while Everett would wait 25 years, under a draft the agency’s governing board issued Thursday. The costs, engineering challenges and construction work to reach the entire urbanized area are that big. The plan, released at an agency board meeting Thursday, calls for $50 billion in new projects and services, funded by $27 billion in new tax collections through 2041, along with existing taxes, long-term debt and federal grants. • Property tax, $25 per $100,000 of assessed value, each year. • Motor-vehicle-excise tax, $80 per $10,000 of vehicle value, each year. The agency now collects 90 cents sales tax per $100 purchase, a car-rental tax of 80 cents per $100 fee, and a $30 vehicle tax per $10,000 value. The $30 rate expires in 2028 because of Tim Eyman’s Initiative 776, so the total rate would drop in 2028 from $110 to $80 per $10,000. “The debate over light rail is over. We are building a system north, south, east and west,” declared CEO Peter Rogoff. The full network would provide 108 miles of light rail, comparable to Bay Area Rapid Transit (BART) or the Washington, D.C., Metro system, he said. The proposal amounts to a campaign kickoff. Several weeks of public forums, as well as online outreach, will take place in Snohomish, King and Pierce counties before the board in June approves a final ballot package for November. Sound Transit hired Rogoff away from the Federal Transit Administration, to replace the retired Joni Earl — and use his national perspective to get this massive plan off to a running start. Years ago, he signed the $813 million grant to help deliver Seattle’s new $1.8 billion Capitol Hill Tunnel. If voters approve a likely November ballot measure, light rail would include 75 stations over a 108-mile network. Among the highlights of the proposal released Thursday: Downtown Redmond would see a Sound Transit 3 extension in 2028, connecting to Marymoor Park and Overlake. West Seattle Junction would get its connection to Sodo and downtown in 2033 — before the Uptown-Ballard line, envisioned for 2038. Bellevue College and Issaquah would get service in 2041. Service to Paine Field and Everett would happen by 2041, winding past Highway 99 instead of tracking along I-5. A full system would include 70 to 75 Link light-rail stations, aiming to serve 500,000 daily passengers, said Ric Ilgenfritz, head of the agency’s system planning division. Bus-rapid transit lines would include 19 or 20 stops. Sounder commuter rail, which now goes south to Lakewood,would stretch all the way to DuPont. The centerpiece would be a second downtown Seattle transit tunnel. There would be one spine from West Seattle to Everett, and its twin from Tacoma to Ballard — crossing like a helix just north of Westlake Station. The new taxes equate to $392 per year for a typical household, the agency says. That covers not only light rail but bus-rapid transit, Sounder commuter trains, park-and-ride garages, operating subsidy and a long-term maintenance fund. The increases are in addition to the Sound Transit taxes that voters approved in 1996 and 2008, which average $330 per household, and would continue being collected. There would be no sunset date on the taxes, as long as they go to build and operate voter-approved service. This week is an auspicious time to announce an ambitious project plan. The University of Washington and Capitol Hill stations opened last weekend to huge and receptive crowds, and an Angle Lake park-and-ride station is scheduled to open in SeaTac in September. 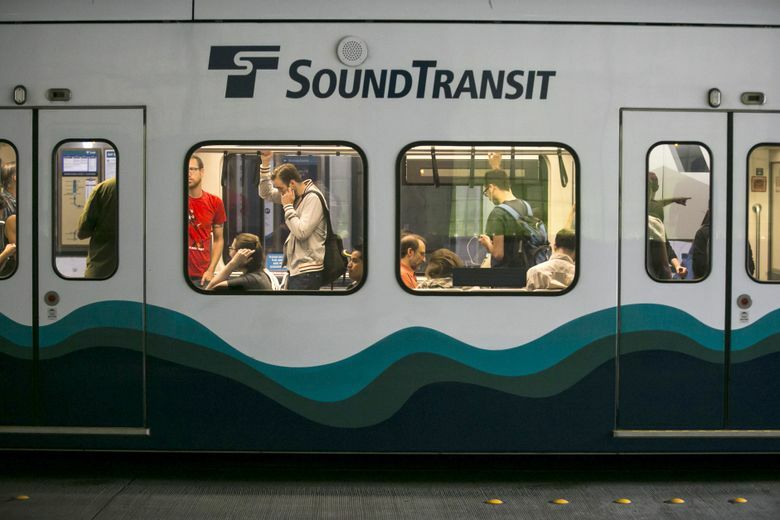 Link light-rail ridership has grown by 20,000 or so passengers this week, to a total 57,000 on Tuesday, leading Sound Transit to add some longer, three-car trains to serve demand between UW and the Seattle-Tacoma International Airport. • Downtown Redmond and Federal Way would be the first to gain ST3 light rail, in 2028. • West Seattle Junction would see its light-rail connection to Sodo and downtown in 2033 — before the Uptown-Ballard line, envisioned for 2038. Transit-board Chairman Dow Constantine, the King County executive, is a lifelong West Seattle resident. From a technical standpoint, West Seattle comes first because of the severe complexity of building a tunnel and six stations from Westlake Station to Uptown (Lower Queen Anne), a part of the Ballard line, transit staff say. Challenges include a second Westlake station two stories lower than the current one. “It’s the most technically difficult part of the entire program,” Rogoff said, waiting to catch transit to his new residence in Uptown. • Bellevue College and Issaquah are proposed for Link service in 2041. The agency set aside for environmental study the controversial Cross-Kirkland Corridor, a former freight-rail route that’s been converted to a walk-bike trail. • Service to both Paine Field and Everett Station would start by 2041, winding past Highway 99 instead of tracking along Interstate 5. But trains would arrive by 2036 at 128th Street Southwest, a crucial crossroads in South Everett close to Swift bus-rapid transit, along with the Mariner and McCollum Park park-and-rides. • A bus-rapid transit crescent, mainly on freeways, would wrap from Burien to Renton, Bellevue and Bothell before branching to both Lynnwood and Seattle’s Lake City. Its usefulness hinges on whether the state effectively provides free-flowing carpool lanes, including the politically embattled Interstate 405 express toll lanes. • Many interim and stopgap measures are proposed from 2019-2024, including “bus on shoulder routes” for I-5, I-405, Highway 518 near the airport and Southcenter, and Highway 167 in the Green River Valley. The plan also would invest in Highway 522 bus lines through Bothell, Kenmore and Lake Forest Park, and to improve the RapidRide C and D lines serving West Seattle and Ballard. • New or expanded park-and-ride sites are proposed at four stations between Highline College and Tacoma; and for bus or rail stations at Boeing Access Road, South Renton, Issaquah, southeast Redmond (near Sammamish), Totem Lake, Mariner and downtown Everett. No park-and-ride areas would be added within Seattle, though the previously approved Northeast 145th Street Station in 2023 will include a car garage. The full plan will be posted at soundtransit3.org by Tuesday, and portions are being published in the meantime, Rogoff said. The tax request prompted state Sen. Reuven Carlyle, D-Seattle, to say he is neutral for now, and to call for sober reflection among leaders and voters. “It consumes the oxygen in the room, regarding the larger questions of what we want to invest in,” he said. In particular, education has historically depended on property taxes, and ST3 adds competition for those, he said. And if lawmakers choose later to boost property taxes — to meet the McCleary court order for adequate school funding — there might not be enough tax capacity within legal limits to fund parks or local services, said Carlyle, whose district includes Ballard. “My district is rabidly pro-transit, pro-transportation. But every school in my district is packed to the gills, and using portables,” he said. Snohomish County’s three Sound Transit board members and Everett Mayor Ray Stephanson praised the plan overall, but criticized the 25-year wait to reach downtown Everett. In a statement, they said they would work toward “an acceptable time frame” to serve the expected 200,000-plus new residents who are expected to arrive before then. The $27 billion in new taxes almost doubles the highly publicized $15 billion figure that met temporary resistance in Olympia, until lawmakers in July 2015 passed a bill giving Sound Transit the tax authority it wanted for ST3. Sound Transit finance director Brian McCartan said that number was just “shorthand” for tax rates that would collect $15 billion in the first 15 years. Campaign organizations have yet to form, though advocacy groups and nonprofits such as the Transportation Choices Coalition have been rooting for expansion plans. Detractors at the Coalition for Effective Transportation Alternatives, including express bus and smart-car boosters, have stepped up their critiques on social media. Constantine and fellow board members are fond of saying that Sound Transit is delivering projects “on time and on budget,” in particular, the new $1.8 billion segment from Westlake Station to UW Station. The 3-mile tunnel to Husky Stadium was completed six months sooner than projected, at $150 million less than estimated when construction began in 2011. On the other hand, the initial 1996 ballot measure promised rail all the way to the University District by 2006, before massive overruns surfaced. That’s now on track for 2021 as part of a UW-Northgate tunnel. However, cost estimating improved greatly since 2001 during Earl’s tenure as CEO, as the agency gained experience.